Hey folks, quick update. I just wanted to thank everyone that came by the table and grabbed a flyer. If you’re a new reader and you’re just reading this now, might I suggest starting with the beginning of the comic, or stroll on over to the archives. Take a look and I hope that you enjoy the story. There’s also a smattering of other, random comics I’ve done over the years. For everyone that couldn’t make it, I hope to attend other shows and hopefully see you there in the future. 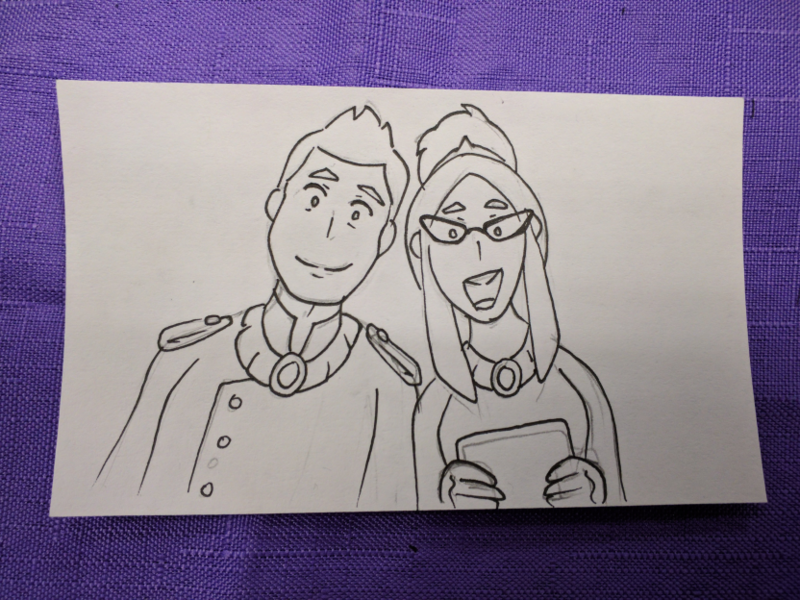 While at the show, I did some sketches of the characters. Take a look, there’s more after the jump. Hey folks, I just wanted to let you know that I’m going to be attending the Olympia Comics Festival this year on Saturday, June 2nd, 2018. Stop by if you’d like to visit, I’ll be there promoting the website and selling copies of Rune Hunters Chapter 0. I will have a table at the Cartoonists Expo from 11am-5:30pm, which will be at the Olympia Center, in Olympia, WA. Visit the Olympia Comics Festival website for more information about the location and schedule. If you’re in the area and can visit, I’d hope to see you there. Come and say hello, and get your photo taken wearing Asura’s hat. Hey folks, I don’t know what happened with last week’s post. Something got messed up with the timestream. Don’t worry though, I got it all sorted out and you should be seeing new comics in the correct, chronological order. Sorry for any inconvenience that a peak into the future may have caused.